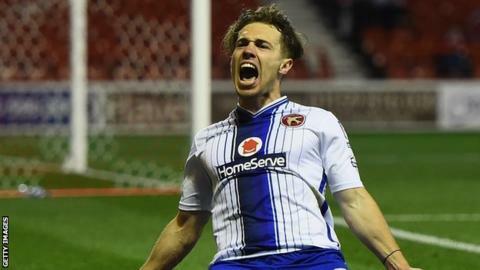 Walsall match-winner Tom Bradshaw says their thrilling League Cup win at Championship Nottingham Forest proves they have "first class" character. Saddlers striker Bradshaw, 23, scored his first senior hat-trick as his injury-time penalty sealed a dramatic 4-3 triumph at the City Ground. "We thought it was a stonewaller for extra time," Bradshaw told BBC WM 95.6. "Even when they equalised in the 93rd minute we still had it in us for one last attack - it was first class." Bradshaw, who extended his contract at the Banks's Stadium until 2017 in June, scored twice as Walsall led 3-1 with nine minutes to go, before Forest substitute Michail Antonio's brace levelled the tie in the last minute. Bradshaw, who has scored 25 goals in his last 42 games, has been on a hat-trick five times in his career without finding that elusive third goal. He scored twice on his league debut for Shrewsbury at Crewe in April 2010 and hit further braces against Bradford and against the Shrews, MK Dons and Oldham last season. Walsall won it in the fifth minute of added-on time when Bradshaw slotted home his spot-kick to send the visitors through. "I missed my last penalty in pre-season against West Brom but I did some practice, I knew exactly where I was going to go and just made sure I hit it cleanly," Bradshaw added. "It was a special moment for me and my family - my dad and a couple of my uncles were in the crowd." The former Shrewsbury forward was the Saddlers' top scorer last season, with 20 goals, and he says beating Forest will give everyone at the club a huge lift as their League One campaign gets underway. "If can keep scoring goals like we are we won't be far off."